Hello Broncos Country! Have you all come back down to earth after the great victory at Mile High? Most likely not I think, probably still in a state of shock and awe. I know I was the last few days and I didn't even see the game live! But it was a great feeling to see the boys stick it to all the doubters, people that didn't believe in us, didn't even think we would score a touchdown. Big props go to the Coaching staff for getting the guys prepped and ready to go with a solid game plan. They played hard all game long and fought to the very end. And we all know what happened in overtime. A play which I am going to call 'The Pass'. Why? because it captures everything about the haters and what people said about Tebow and this team. That Tebow can't pass, is inaccurate, he won't be able to complete a pass on the 1# ranked pass defense. As we know Tebow and the Broncos proved every doubter wrong. Everyone will remember where they were when Tebow completed 'The Pass' to put not just himself but the Broncos on the map. 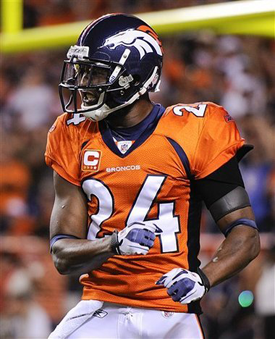 But the season is not over, with the win the Broncos progress to the divisional round to face the Patriots. We are on the road again and heading to Foxborough for this clash. As you probably remember the Broncos played the Patriots during the regular season where we were beaten by a score of 41-23. Most people outside Broncos fans thought that the Patriots thoroughly dominated us in that game which could not be further from the truth. 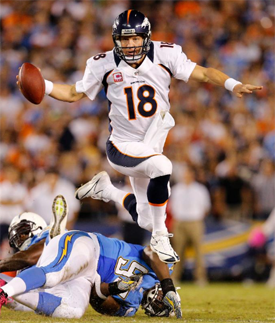 The Broncos went up early and were dominating on the ground. But three fumbles in a row would turn the tide of the game. The Patriots managed to convert those turnovers into points and get back into the game and by that stage the life had gone out of the Broncos. The second half was just a wash as the Patriots had already won. The Broncos had lost all momentum and confidence in themselves and it would take them a further three weeks to get out of their funk. 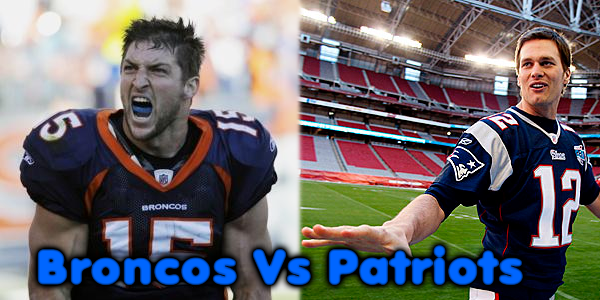 The Patriots should be a little concerned with this match up. It was also interesting that after the last game Brady said to Tebow "Maybe we will see you again" That is where the below picture comes from and I added the caption. Now let's go out and do it! Then there is the return of McD. People say he won't be much of an advantage to the Patriots but then why were they in such a hurry to have him start this week? This won't provide much motivation for the team but maybe a few players that McD gave 'special treatment' too that want to return the favour. They will be a little more pumped for this game. It is interesting to note that some people are coming around to the idea that McD isn't that bad, what with the evolution of some of his key picks into good players. I will say this McD was a good coach and had a vision for this team but I disliked him as a person (The disliking him as a person is what causes people to think he was an idiot). He left this team in a good position with key players that we wouldn't have made the playoffs without. First lets being with the defense. I will say this now I really like our defense now then I did last time we played the Patriots. We now have a few more pieces I will say are key to this game. The first is 36# Bush S/CB who really played a good game against the Steelers. He is now playing as the Dime CB and he has surprising good coverage skills. (When you think about the return of guys like Squid and Vaughn I really like our Secondary next year). Bush is a safety by trade but was excellent in his coverage on TE Miller taking him out of the game. With him, Goodman, Champ and Harris I think we can hold down the Patriots weapons. Add in Bruton, Carter and Woodyard and I think we can finally cover all the Patriots can throw at us. Last time we were always leaving one man get free because of the lack of good cover guys. That hopefully I think has been solved. The other key piece for me is the emergence of Ayers and the return of Miller. Miller I think has come to grips with his issues having the cast and has confidence back in his ability. He was sorely missed last time we played the Pats. Then there is Ayers who I think is key to this game. He played great last week against the Steelers and picked up two sacks. Also it was funny to note that all the media sites were reporting that Ayers had 'Doubled' his season total. Ayers actual finished the year with 3 sacks. I mentioned in last weeks preview that I thought pretty much everyone missed the sack Ayers had on Orton in the Chiefs game. I guess I was right. The reason I think for Ayers explosion last week was he was finally let off the leash. I would not be surprised if Ayers's primary assignment was to read run first then rush the passer. Being one of our best run defenders and that he had the rookie Miller outside him, who struggled to set the edge in the run game all year, that his first read would be run. 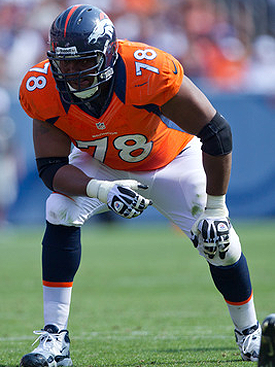 Against the Steelers the Broncos players said that Allen was sending 'the kitchen sink' at Berger all day long. This new freedom I think let Ayers attack the line looking for sacks and not playing the run as much. (Also probably the reason why Redman got 112 yards on 17 carries.) The reason I think this is key for this weeks game is you can't send 5-6 guys regularly against the Patriots. They have too many weapons, you need those guys to cover. When Allen was asked about the kitchen sink comment and what he would do against the Patriots he responded saying he was going to be sending 'everything including the garbage disposal'. I for one am not a fan of sending everyone against Tom Brady (maybe to being the game but not for the whole 60 mins). I like what the Giants did against the Patriots in the Superbowl. Play dominate at the LOS with your front four and occasion send a fifth blitzer. I am hoping with the emergence of Ayers that him, Bunk, Thomas and Doom will be enough to get after Brady. Add in a few creative blitzes with Miller and hopefully we can but Brady on the turf. That allows us to drop 6-7 guys into coverage preventing Brady from finding the open man. It will be up to these 5 guys to do the number on Brady because if we have to send any more than that we have already lost. Another issue with sending helps of blitzes at Brady is the Patriots have a good screen game (though McD tried to demolish it with his last stay at the Patriots and with his return will it be a none factor?) The Superbowl the Patriots played against the Eagles who blitzed on a lot of plays were beaten by the Patriots screen game. (Some how the Patriots managed to call a screen on pretty much every play the Eagles blitzed, I wonder how....) If we send to many against the Patriots Brady will quickly dump it off and beat us that way. 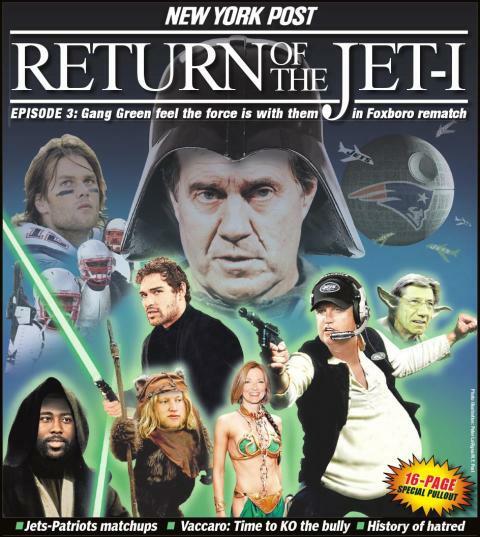 I also doubt the Patriots pull a fast one and try to run heaps. But a few draw plays will probably happen to offset the pressure. If we can cause their offense to turn the ball over a few times the W in the win column will be easy to put up. Enough on the defense time for some offense. The Patriots D isn't very good, they have a solid middle but not much else. The one thing we CAN NOT do is TURN the BALL OVER. If we give Brady the ball too much he will beat us. The Patriots will probably back off a bit compared to the Steelers and be more wary of that deep ball. So we run, run and run some more. A health dose of McGahee (who wasn't healthy in our last game against the Patriots) and a few carries by JJ (I think Johnson could tear up the Pats) we should be sweet, but for the love of the holy spirit don't turn the ball over. When we do pass send someone long to spread the defense out and then hit those slants and crossing routes. It is time to get those TEs involved more. Now Tebow, oh sweet, sweet Tebow. Keep it up buddy. Against the Steelers I really think he started to come into his own. He throw the play into tight windows and let his receivers make a play. I want more of the same, maybe pop that completion percentage up into the 50s but I think you will do just fine, but keep that intensity burning. Now was the game against the Steelers the game I keep talking about where Tebow blows it up? 10 completions for 300+ yards? I say no, that is a regular game for a QB. When Tebow blows up a game you will know, 20+ completion and 400+ yards is blowing it up. But he did blow our minds with that final play of the game. Speaking of which, Thomas has some serious speed....especially for a guy that torn his Achilles which is usually a career killer for skill position players. Nice job being patient and doing your rehab correctly to get back to 100%. The last time these teams met, the match-up was closer than the final score would indicate. Denver pummeled the Patriots on the ground in the first half; things turned only when the Broncos started fumbling, forcing them to try to play catch-up. The Patriots also won't have Andre Carter this time around. Demaryius Thomas will be a handful for any Pats corner that lines up opposite him, though the loss of Eric Decker limits Denver's options. Eddie Royal in the screen game could be key. Oh, did I mention Tim Tebow yet? Yeah, he's playing, too. I have a feeling that on the road, we'll see even more of the read-option, given Tebow's accuracy issues. New England's defense isn't nearly as punishing as Pittsburgh's, but dropping back to pass more than 15-20 times in an away game invites danger. 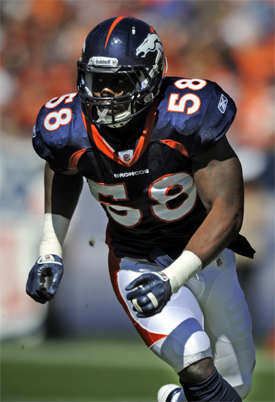 Denver linebacker Von Miller looked better last week than he has in a month, even with that club still on his hand. He seems to be adjusting to it, and New England's older, beat-up offensive line will have a real test here. I don't think Brady will be quite as comfortable as he'd like to be. This smells like a ballgame to me, folks, and you just never know how long Denver will be able to keep conjuring up that Tebow magic. If the pass rush is going, those screens and little slants to Wes Welker off the three-step drop will be Brady's best friend. Oh it is that time again the prediction. This game will be close and I would expect nothing less. The Patriots are a veteran team that have done this all before. 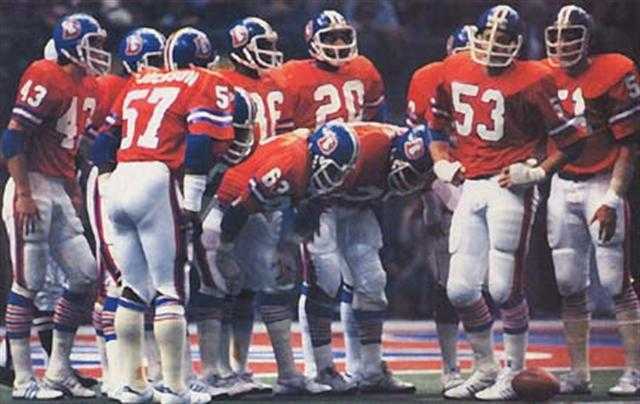 They will push the Broncos right to the end. I do think we can win this game but it will require the Broncos to play a flawless almost prefect game to beat the Patriots. So with that said about 50+ points will be scored in this game with the Broncos taking home the victory, probably in overtime (which we are automatic in, 4-0 so far this season). 28-21, Broncos win, now TAKE IT!!! Tebow is ESPN poll's favorite athlete or most popular, whatever, people like Tebow! DT needs an optimus prime nickname, can you help us out? A few of the Patriots lovelys. Q: Why is Patriots player Rodney Harrison perfect for a broadcasting job with NBC? A: Anyone who has played with Bill Belichick knows a thing or two about being in front of a camera! Looks like we will be running this game without a FB, but we have a long snapper for the game at least. I hope everything is ok with Paxton and his family. Also looks like Fisher is going to the Rams, hopefully that means Allen will be staying in Denver! Sorry i haven't posted, the blog sites are being a pain right now. Allen and McCoy should both be staying now. Paxton's wife is having difficulty with her pregnancy of twins. He is staying back to be with her. Hey Digger thanks for the info on Paxton. Bit disappointing with the loss but we were out played by the better team. They were better than us in pretty much every phase. Plus injuries in the secondary. Hey we were flat out beaten. And was what I said in this preview. The team didn't have any emotion or desire, but they really didn't have a chance to get into the game. Anyway with the season of we have a few things coming up in the future before FA starts in March.